Posted Saturday, May 18, 2013 6:17 PM EDT by HAMILTON SPECTATOR & filed under Barton St..
Fifty years ago, a stroll through the meatiest part of Barton Street – the Ward 3 section between Wellington and Ottawa streets – was a stroll through prosperity. The Barton Street of the early 1960s was a buzzing beehive of shops and people. It was – choose your favourite analogy – an economic engine for the city, a sturdy backbone of business, a commercial heart that helped keep Hamilton healthy. A stroll down the Ward 3 part of Barton Street now is a bit like catching a Frank Sinatra performance when he was near the end. There’s a resemblance there somewhere, but it takes a lot of squinting and it makes you wistful for what once was. 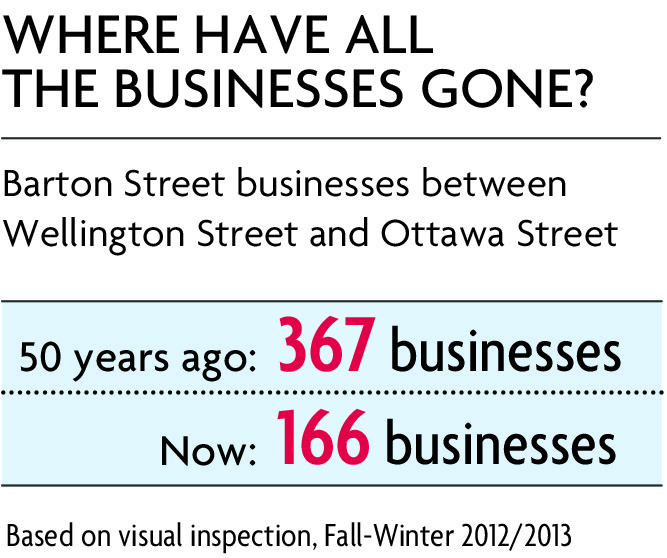 Fifty years ago, there were 367 businesses on Barton Street between Wellington and Ottawa. Today, there are fewer than half that. Back then, on average, there was a barber shop and grocery store on every second block. There was a butcher, a cleaner and either a furniture or appliance store on every third block. There were 11 pharmacies, 10 shoe repair shops, eight tailors, seven jewellers and five billiard parlours. Today, there are 166 businesses on that same stretch of Barton, give or take a couple. (Sometimes it’s difficult to tell if a location is home to an active business or one that has simply been abandoned.) There are 13 variety stores, 10 second-hand or thrift shops and just two pharmacies. Meanwhile, 150 addresses are now empty buildings, vacant lots or storefronts that are either vacant or have been converted to street-level apartments. On average, there’s a vacant building or empty lot every 100 metres and two vacant storefronts per block. On Barton between Gibson and Sherman avenues, for example, 40 per cent of buildings, storefronts and lots are vacant. The city is now turning some of its attention to Barton Street East in advance of the 2015 Pan American Games in the hope of finding ways to breathe life back into a street that has withered away, decade by decade. The historical model that shaped Barton Street – a strip of small stores, often with the shopkeepers living above them – is no longer sustainable, certainly not for such a long street. “Nobody thinks that now, ” said Glen Norton, Hamilton’s manager of urban renewal. “Even the people living there don’t think that. The distance along Barton Street from Wellington to Ottawa is 3.4 kilometres, or just over two miles. In that 3.4-kilometre strip, there are 332 taxable properties. From 2011 to 2012, the taxes levied by the city for that two-mile stretch of Barton actually decreased – from $2.171 million in 2011 to $2.168 million in 2012. Falling property taxes are almost always a sign of falling property values, according to Larry Friday, the city’s director of taxation. About one in three properties in that stretch of Barton saw its taxes decrease last year from the previous year. The city collects about the same amount in taxes just from the properties occupied by Costco, Home Depot and Sobey’s in the Ancaster Meadowlands as it does from the 332 properties that make up the 3.4 kilometres of Barton from Wellington to Ottawa. On Barton itself, the city collects nearly twice as much in property taxes from The Centre on Barton between Ottawa Street and Kenilworth Avenue – formerly the Centre Mall – as it does for the entire stretch of Barton Street from Ottawa to Wellington. While taxes levied on Barton from Wellington to Ottawa decreased slightly from 2011 to 2012, taxes levied on the redeveloped Centre Mall property shot up by $430,000 last year as new big-box stores continue to fill in the property’s footprint and raise its value. More than 50 Barton Street addresses between Wellington and Ottawa streets are former storefronts that have been converted to street-level residential apartment units. This despite the fact the city’s zoning code for much of Barton does not permit ground-floor residential apartments in commercial spaces. Storefront apartments are a concern for both the city’s building department and other business owners because some of the units lack basic amenities, such as kitchens, sinks and proper plumbing. Storefront apartments are particularly prevalent between Wellington and Wentworth streets, the section of Barton Street highlighted in Tuesday’s part 2 of the series. 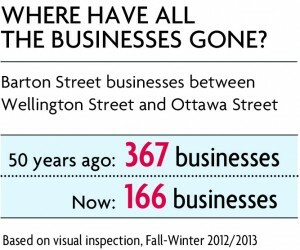 Fifty years ago, there were 107 businesses in the eight blocks between Wellington and Wentworth streets. Now, there are fewer than 40. By comparison, in that same stretch, there are 42 storefronts that are either vacant or have been converted to apartments. About one in every 12 taxable properties on the Ward 3 part of Barton Street is officially vacant, according to the city’s vacant building registry. Add in street-level vacancies, empty buildings that haven’t been registered and empty lots and about one in every four addresses on Barton between Wellington and Ottawa streets is either a vacant building, a vacant storefront or a vacant lot. A new vacancy was added to the list on March 22 when the Bank of Montreal at the corner of Barton and Victoria streets closed and moved to a branch on James Street North. You’ll read more about vacant properties in Wednesday’s part 3, which looks at the Wentworth Street to Sherman Avenue section of Barton. The 2015 Pan Am Games will shine a bright light on Barton Street, particularly the section between Sherman and Gage avenues. The impact of a new stadium and a redeveloped area around it are the focus of Thursday’s part 4. In the span of just over a year, tax arrears for the Ward 3 portion of Barton Street jumped by 13 per cent, from $973,000 at the end of 2011 to $1.1 million in February. In fact, the tax arrears for the Ward 3 part of Barton Street are more than the tax arrears for the Ward 3 parts of King Street East and Main Street East combined. One in 10 properties along the Ward 3 stretch of Barton is at least two years in arrears on its property taxes. You’ll read more about tax arrears in Friday’s part 5, which looks at the Gage Avenue to Ottawa Street section of Barton Street, where arrears are a particular concern. The findings of The Spectator’s investigation raise questions about how best to rehabilitate a major inner-city artery that was once a thriving commercial hub of the city. Over the next week, you’ll read stories about people who live, work and own property on the street – tenants, business owners, developers, landlords, city officials, even the beat cop and a hospital president. Much of what they have to say is difficult to digest. Tenants complain about filthy living conditions. Landlords complain about tenants who just stop paying their rent. Business owners lament the high numbers of vacancies and problems with vandalism. Developers bemoan red tape and zoning rules that tie their hands. Drugs and prostitution are the biggest problems along the heart of Barton Street, according to a number of residents, business owners, landlords and the Barton Street beat cop. 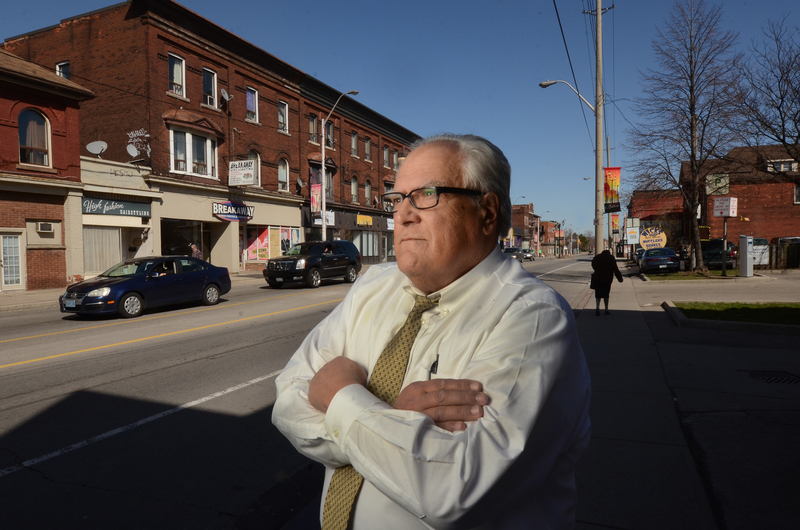 “I’ve noticed a lot more prostitutes on the corners and I think that’s the thing that makes me the saddest, ” said one tenant who lives in a storefront apartment near HamiltonGeneralHospital. Economic issues aren’t the only problems plaguing the Ward 3 portion of Barton. Poor health and social outcomes are also significant concerns. Barton is the spine that runs through the middle of four distinct neighbourhoods between Wellington and Ottawa streets. 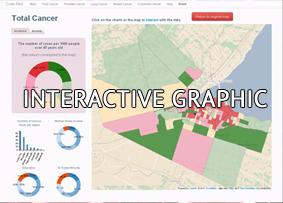 Health, social and economic data analyzed for The Spectator’s 2010 Code Red series and the BORN series a year later showed this corridor had some of the poorest outcomes in the amalgamated City of Hamilton. About 12,500 people live in this thin strip of 30-some blocks, and about one of every three of those people lives below the poverty line, according to Statistics Canada. One in eight babies delivered between 2006 and 2010 in those four neighbourhoods was born to a teenage mother, and nearly 10 per cent of all babies delivered during that time were low-birth-weight babies. One in three adults didn’t have a high school diploma. Only one in 20 had a university degree. The average value of a house was $117,000 and one in every six houses was in need of major repairs. The rate of emergency room visits for the four neighbourhoods along the Ward 3 part of Barton Street was 10 times higher than in the Flamborough neighbourhood that had the city’s lowest rate of ER visits. 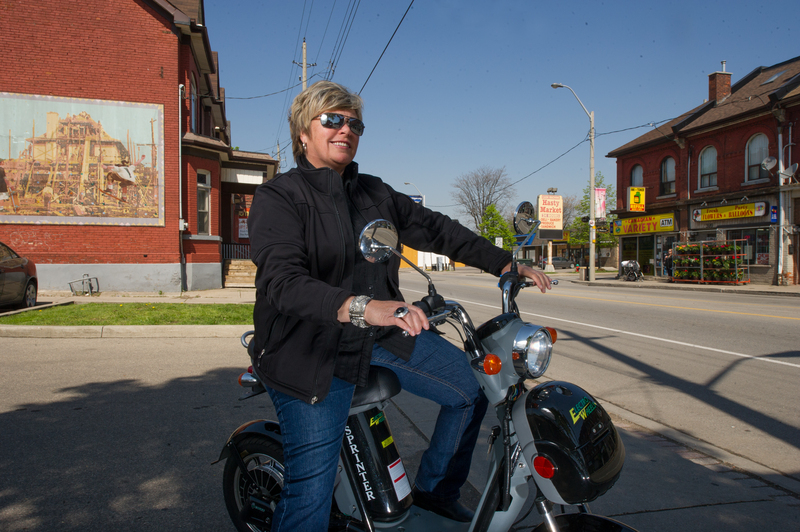 One person who has become sensitized to the problems of the Ward 3 part of Barton Street is Teresa Smith, president of HamiltonGeneralHospital, which anchors the western corner of that stretch. She’s been giving a lot of thought to the social determinants of health – the social and economic factors that have such a major effect on health, even if those factors may not seem related to health at first glance. Fix those things – get people educated, get them employed and earning a better wage – and there’s a good chance that better health will follow. Bernie Morelli has a bum ankle on this day, so a Barton Street walking tour has to be conducted instead from the front seat of the Ward 3 councillor’s car. 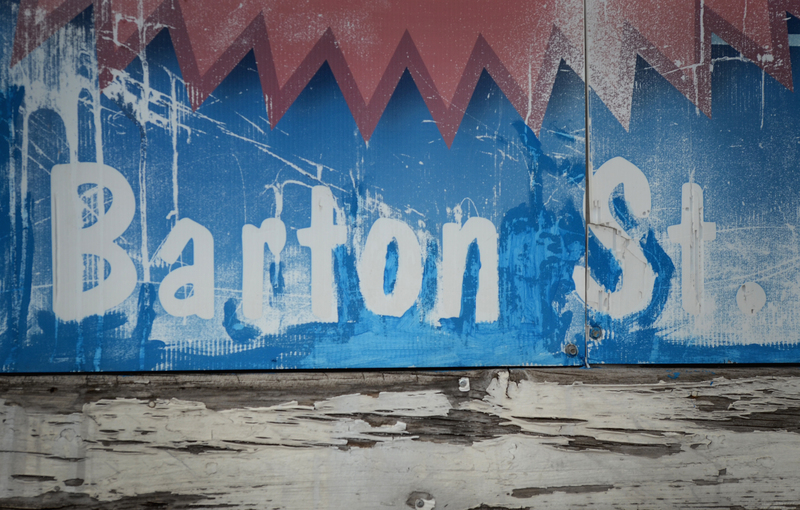 Barton Street is hurting, and nowhere more than on the strip that runs through his Ward 3. For two hours, we travel back and forth along some of the most devastated stretches of Barton, accompanied by Morelli’s stream-of-consciousness soundtrack that is part history lesson, part lament for the present and part hopeful optimism for the future. No story ever comes to a natural conclusion. Every storefront sends Morelli off on a new tangent in midsentence. He rattles off the names of people and families who owned the buildings and ran the businesses years, even decades ago. Some of the storefronts look like remnants of an oversized time capsule, as if the facades have been frozen in place for 50 or 60 years. Every so often, Morelli will point to a building, lean over and ask if you remember so-and-so, who used to own the business that was here, or some other so-and-so who once was a political candidate. “No? You’re not old enough, eh?” and then Morelli chuckles and carries on, distracted by the next storefront down the street. Two seconds later, he points at another business and sighs. That’s Barton Street. Two steps forward, one back. One forward, two back. He worries about each business the way a parent frets over a child. He stops in front of one ethnic food business. A competitor has just opened a big new store in another part of the city, and Morelli is concerned it could drag enough customers away that the Barton Street shop would have to close. “I could end up with a bedsheet over this building and, quite frankly, it worries me, ” Morelli said. A few blocks further east, he points to an auto repair garage he says was being hassled by the city over a sign issue. To Morelli, it was a tempest in a teapot for an area that has far bigger problems to worry about. Benedetti wrote that in 2008. Five years later, the store is still closed and the sign still hangs there, just as forlorn now as it was then. There’s 628-630 Barton St. E. – the decrepit storefront owned by Rev. Vincent Kim Van Toan, a Roman Catholic priest from Vietnam. A Spectator investigation last year revealed the slumlike conditions of two apartments inside the shabby building owned by Kim. Now it’s on the city’s vacant building registry. So it goes, block after block. Morelli wears out plenty of shoe leather on Barton Street, routinely monitoring alleys, parking lots and the backs of buildings for graffiti or piles of garbage. “I harp away at city staff to at least keep the areas clean, ” said Morelli. “The least we can do is sweep it. That sums up Barton Street in rather discouraging fashion. Prostitution? Dilapidated buildings? Wretched storefronts that hide derelict apartments? Or pulling weeds from parking lots and hauling garbage out of alleyways? “I can’t get discouraged, ” said Morelli. “If you want to wrap it up and go home, you can do that. I can’t. “Anyone that’s going to come at you with this magical panacea that ‘I’ve got the solution, ‘ then show it to me and I’ll step aside, ” he said. You can learn a lot about what’s happened to Hamilton – good and bad – by simply looking at what’s happened to Barton Street in the span of just two or three generations. Shelly Wonch is the executive director of the Barton Village Business Improvement Area. It doesn’t take her long to rattle off three significant factors that helped hasten the flight of businesses from Barton Street and Hamilton’s downtown. There was the mass popularity of the automobile, followed by the development of large suburban malls. Then came the steady decline of the reliable industrial jobs that once proliferated on Hamilton’s waterfront. “Everyone knows that, right?” Wonch said. “It’s not business in general or poverty that started the decay of the business districts. “Did businesses just leave and did they just shut down for no reason? No, ” Wonch added. “If it took over 30 years for it to have major issues, it’s going to take time to renew it. All three factors became intertwined over time. Well-paying blue-collar jobs allowed families to buy a vehicle and move to the suburbs. The advent of malls with free parking meant those families didn’t need to return to the core to shop. Everything they needed was under one climate-controlled roof. One standard-sized Walmart Supercentre now has about the same floor space as 100 or so of the shops that lined Barton Street. Then the jobs dried up and the companies disappeared. Studebaker, International Harvester, Dominion Glass, Firestone, Westinghouse – all gone. The two major steelmakers and several smaller steel companies that managed to survive now employ a tiny fraction of the workforce they employed at their peak. Add them up and in the course of not much more than a generation, nearly 25,000 jobs were lost from the companies on and around Hamilton’s industrial waterfront – enough to support 100,000 people. That also doesn’t count the spinoff jobs, such as those that once graced Barton Street and catered to those workers and their families. “This is where the working-class family could live and the breadwinner could walk to work at the steel mills or in the port lands or whatever, ” said Glen Norton, Hamilton’s manager of urban renewal. The street left behind is now at odds with its historic purpose. “Now you have an issue of a very long street, all of it designated commercial, ” said Norton. “A whole bunch of commercial space opportunities for not nearly as many people living there. “As a secondary thing, the spending power of the people who are living there is not what it might be elsewhere in the city. It’s clear the city has to change the balance between commercial and residential use on Barton Street. “What would be that right balance?” Norton asked himself. “Should 40 per cent of that street be commercial? Should it 50, 60 per cent? Andy Walczak’s two properties at 379 and 383 Barton St. E. are home to four of those small storefronts that gradually evolved into apartments. In a Barton Street coffee shop, Walczak and his property manager, Shakeel Hanif, explain they’d love to turn the units back into commercial space but there’s just no interest. Walczak has owned the buildings for a year and admits the experience has been tougher than expected. “It’s been challenging, but I’m not sorry, ” said Walczak. It was the summer of 2002 – “the year Portugal was in the World Cup, ” he recalls for some reason – and Michael Hayes had returned to Hamilton for a visit. As a child, his earliest memories were forged on Barton Street, but he’s travelled far since then, literally and figuratively. He’s become a professor in the geography department at the university in genteel Victoria, but rough-and-tumble Hamilton was the city that moulded him, for better and for worse, from a young boy into a man. It was by no means a smooth metamorphosis. Michael Hayes, a professor – even he finds the irony a bit rich sometimes. More than once he’s told the story of marching in to his Grade 11 class at DeltaSecondary School in 1971 and announcing defiantly that he was done with school. He was 15, maybe 16, a boy thinking he was a man. He left home, moved in with a friend and became hooked on drugs. And then one day, before it was too late, the man became a boy again. He swallowed his pride, went home, and then walked back in to Delta seeking a second chance. Hayes made the most of it. Class valedictorian at Delta, then bachelor’s, master’s and PhD degrees at McMaster University, followed by more than two decades in British Columbia teaching at Simon Fraser University and University of Victoria, where he has become an expert in issues related to neighbourhoods and health. And yet, Hayes never seems far from Hamilton. So here he was on this summer’s day in 2002, deliberately choosing to take a drive along Barton Street, where he first lived as a child. The trip started happily enough, he recalls. “At James Street North, people are celebrating and the cafés are happening and people are on the street, ” said Hayes. “But by the time you get past Mary Street, you’re in a totally different world, in a world of boarded-up places and tenements and the conversions where people have apartments in what used to be storefronts, ” said Hayes. There’s a quick shudder in his voice. “By the time I got to Kenilworth, I had tears in my eyes, ” he said. On page 1,019 in the small type of the 1962 Vernon’s Hamilton City Directory, there’s evidence of that childhood. At 307½ Barton St. E., above Medland’s Greeting Cards shop, were the Dodson Apartments. In unit 4, there’s a listing for Robert Hayes, Michael’s father. The Dodson was a three-floor tenement walk-up, with a parking lot out back, alleyways nearby to explore and the GeneralHospital a block away. The Hayes family lived in a three-bedroom apartment, with the parents in one, two sisters in another and Michael and his foster brother in the third. His father worked as a janitor for the school board, then at Liquid Air, then at Stelco. “He would have made a working-class wage, but in those days, you could live on a working-class wage, ” said Hayes. “We weren’t destitute, but we certainly weren’t well-off. Hayes recalls playing on the grounds of the hospital, which was surrounded with big wrought-iron fences. Local kids would take sticks and try to knock chestnuts out of the stately trees that lined the property. “Now it’s this monolith that comes right to the edge of the street, ” said Hayes. “It feels and looks like a prison. There’s not a tree to be seen. And yes, Hayes admits sadly, it’s hard to reconcile today’s Barton Street with the Barton Street of his childhood. Armed with a job and a decent wage, those immigrants moved up and moved on, replaced by new waves of people from different parts of the world at a time when the economic base of the city was shifting radically. “Suddenly, those jobs that were available for everybody disappeared, ” said Hayes, and the next wave found themselves without “that same opportunity for jobs that paid well, that allowed people to get on their feet and move on up. “It’s very hard for me to go along Barton Street, ” Hayes said. Barton Street: A Code Red Project examines the Ward 3 portion of Barton Street East, which extends between Wellington and Ottawa streets. Information for the series is from the City of Hamilton’s finance, planning and building departments; the provincial land registry office; interviews with tenants, business owners, property owners and city officials; and visual inspections conducted over a period of several months. Historical information for the 50-year comparison of Then versus Now was obtained from the 1962 Vernon’s Hamilton City Directory. Some property usage or financial information may have changed prior to publication.